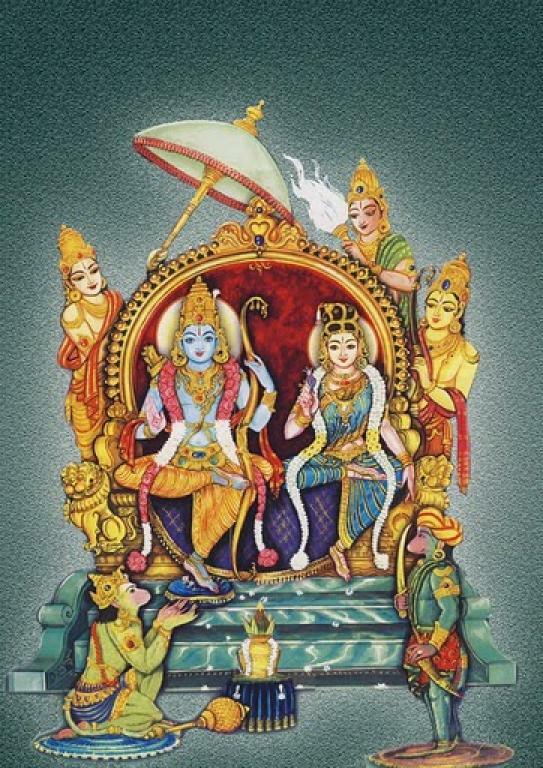 Today is Sri Ramanavami. On this holy occasion, I convey to every one of you my hearty wishes and prayers. The last 8 days were indeed hectic. The first day was at HQ where I spoke on The Three Queens of King Dasharath. Second day was at Chatsworth sub-centre where my topic was The Two Birds – Trials and Triumphs. On Friday and Saturday at Pietermaritzburg sub-centre. On Sunday at Asherville Sri Sarada Devi Ashram. Monday at HQ. Tuesday at Phoenix sub-centre and today at HQ again on The Divine Birth of Sri Ram. My earlier write-up on lord Sri Rama and his sweet name is still having the highest number of views compared to other posts. When I was thinking what I should place here today, I had just glanced the Tamil Monthly magazine of our Order, Sri Ramakrishna Vijayam, brought out by Chennai Math and was thrilled to see the cover page image that gives a picture of Ram durbar as it is generally known. In North-Indian painting of the Ram Durbar, Angad is rarely included. The epic Ramayana whether one reads Valmiki’s invaluable original in Sanskrit or Tulasidas’ charming creation in Hindi or Kamban’s mesmerizing masterpiece in Tamil, surely abounds with the galaxy of characters. Some are major and others are minor. But each character stands for some sparkling quality and none is insignificant. Angad, losing his father Vaali in the hands of Sri Rama slowly raises to the occasion. Rama’s protective cover guides him to such an extent that he goes to Lanka and meets Ravana as Rama’s messenger! What a naughty boy he was in the presence of mighty Ravana! Tulasidas’ description of the encounter Angad had with Ravana at his assembly is undoubtedly an all absorbing account. It shows that Angad was absolutely fearless. Understandably there were some comical moments in the forceful dialogues between the unequal two, yet the whole episode signifies the wonderful physical and mental strength of Angad at that young age and his unwavering devotion to the holy feet of Lord Raghunath and thus, I feel Angad rightly deserves a place in the Ram durbar. Please accept our loving and humble pranams on this auspicious day! It was such a joy to have read this wonderful blog early this morning. 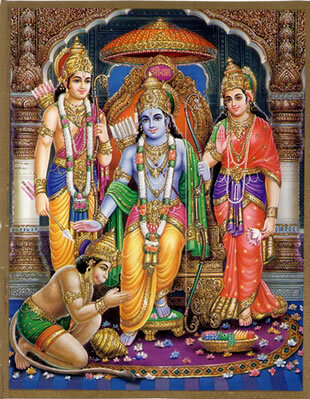 It is the very first time that I have seen Angad in a painting with Sri Ram and Sita. We derive so much knowlege and inspiration from this blog. Wishing Maharaji a very Happy Ram Navami and May Sri Ram and Mother Sita guide and bless us all on our journey of life. Yes, the picture with Angad is indeed rare and thats why it attracted my attention. Glad that it gave you joy. I take this opportunity in wishing you and all the readers a blessed Raamnaumi. How blessed are we to be born in a time when the merciful Lord appeared less than 200 years ago for our benefit! “He who came as Rama and Krishna, has come in this form as Ramakrishna” declared the Master. May Shree Rama eternally inspire and guide us. Yes, indeed we are blessed to have two-in-one and in our foolishness we do not understand the glory of our Master! Perhaps it is hard to understand that. Otherwise would Swami Abhedanandaji, a direct disciple and who stayed with the Master day and night say that “jaanaami tattwam nahi deshi kendram, kimvaa swarupam kathameva bhaavam…” I do not know your real nature, O wisest among the learned! How is your nature or how is your ecstasy?” And so he says that we should wholeheartedly pray to Master to bless us by His compassionate glance. Thanks for the wishes and the prayers. I have not read much about Angad too. This post here makes me want to read more about his part in the Ramayana. My interest was kindled in knowing about Angad when I started reading Sri Ramcharitmanas. And when I saw the picture I could not contain my pleasure. Yes, lot more can be written about Angad. happy Sri Ramanavami to you. Yes, it was certainly 8 days of great joy hearing the praise of Rama. How blessed are we to have your holy company and listen to your words on Ram. It’s always sad when any celebration comes to an end and difficult for one to say, now lets keep him (Ram) in our hearts and in our minds. I guess we, Hindus are lucky as we have so many festivals to keep our minds constantly at the feet of the Lord. Thanks for your appreciative words! You have rightly said that we as Hindus, have functions one after the other so that we may keep our mind on God and lead a God centred life. Wonderful! My most humble Pranaam on occasion of RAMNAVAMI. As usual your Posts always give a new insight on Festivals of India. I remember you telling me about famous RAM DARBAR original painting by Shri Ravi Varma but I forgot where this original painting is today! I have taken the liberty of Posting Link of VEDANTA IN PRACTICE in our Group of Devotees of Holy Trio without your permission!! Oh! no! Sorry, you don’t require any permission to place it in the Holy Trio group. Yes, indeed it is fascinating and worth saving! This is yet another addition to this beautiful blog. When I read the post, Sri Rama and his sweet name, I suddenly recalled the incident about Sri Ramakrishna and the Ramayet sadhu who had come to Dakshineswar. He would always stare at the scriptures he took with him and tears would run down his cheeks. When Sri Ramakrishna opened the bundle, he saw nothing but “Sri Rama” written on each and every page. No doubt this is the actual impact of his sweet name on those who understood the true worth. And Maharaj, today as I ponder, Ramalala has infallibly engulfed my inconsequential mind. How I wish to get hold of him, take him in my arms and caress him! Sweet Ramalala! I really feel what Goswami Sri Tulasidas ji had undergone when he wrote the song, “Thumaka chalata Ramachandra” when he described that the child Rama pulled him by his hands and showed him, his child form and thus he wrote the song, looking at the infinite baby. My favorite lines in that song are, “Raghuvar chavi ke saman, Raghuvara chavi bania” as he thinks of a comparison to the picture of his beautiful Raghuvira, he can’t think of anything and finally decides that his beautiful form can only be compared to his form itself. Wish we had a bit of that devotion and good conduct to see him through these mundane eyes! Though it is not apparent from where I currently stay, it was a sight to behold on the early morning of Ramanavami when we used to climb to the terrace of our home to see the surrounding houses and temples have hoisted fresh red flags with Mahavira on them, flying gloriously. I could only find that sight in Dhanbad and adjoining areas, not here. Anyway, I must have bored you with my gibberish. Well, you have not bored me but given me some food for thoughts! Your outpouring clearly spells out how much feeling you experienced when you read this post. Your writing is indeed inspiring. Your nostalgia for the Dhanbad scenario is quite understandable. Sitting in a far off land, I too sometimes feel the same but you will be surprised how much I am being compensated. I must tell you how Rama navami is celebrated in our centres here. This reply may be longer than your response!! There were Satsangs every evening from the first day to the last navami day i.e . for all nine days! As you are aware, Satsang here has a definite pattern. Everyday I had to speak somewhere i.e., either at Durban or any of our branch centres. All my discourses were based on Ramayana either by Tulasidas, or Valmiki or Kamban. Saradaprabahananda this year went to Ladysmith branch and gave discourses there for nine days. The Ramanavami day prog at HQ starting at 11-15 am with Puja to Lord Sri Rama by a devotee couple within the temple, went on followed by a havan. On the evening of the navami, Satsang attracted a large number of devotees. There were lot of bhajans and kirtans till the end of the prog. Selected passages from Sri Ramcharitmanas were sung to the traditional tunes every evening satsang. The temple was beautifully decorated. Finally with arati to Rama and offering of flower to Him by every assembled devotee the prog came to an end with distribution of prasad. And coming to your point of ‘his beautiful form can only be compared to his form itself’, I cannot but quote again the same Tulasidasji who says about the prayer of Manu (Dasharath’s earlier birth). His fervent request was that Lord Hari to be born to him as his son! And he demands from the Lord that “chaahaun tumhahi samaan suta”- wish I would have a son like you!”. Well this must be a tall order to be complied with! So, the Lord in reply pathetically tells him “aapu sarisa khojoun kahan jaayi?” – Where shall I go to find my equal?”. God is unique. Salutations and Best Wishes to Swamiji on this very auspicious day. It is indeed an honour and privilege to be blessed on this Holy day of Sri Ram Naumi by Swamiji’s Greetings and delightful words of wisdom. May we continue to be worthy of such loving Grace! Humble greetings to you on the auspicious occasion of Sri Ram Navami. The picture that you have posted is truly beautiful and sweet. What you write about Angad is quite interesting. Ever since childhood I have heard my father speaking of his two favourite heroes – one of them is Angad for his sheer bravery and resounding sincerity. The other is Ghatotkach, the son of Bhima. Hope to receive more light from your blessed pen! The two names that your father liked – Angad from Ramayana and Ghatotkach from Mahabharata – are indeed very lively characters. Though they play minor roles yet significant in taking the story further. I don’t know why such off roles always delighted me too. Last year in one Conference on Ramayana here, I spoke on Shabari for 1 hr 50 minutes! The organizers were kind enough to allow me such long time, seeing the enthusiasm among the listeners. I shall try to focus on them in due course in my blog. Featuring Angad in Ram’s durbar is a very rare creation. But this proves that all the characters in Ramayan are important and Lord Ram takes into Him every creature that surrenders to Him. Welcome to this blog and also for your comment! Yes, ‘maamekam sharanam vraja’ – ‘surrender to Me alone’ thats the command of Lord. Your article on Adorable Angad and the picture of Ram Darbar with Angad in it caught my attention. I was naturally curious as to why the “North Indian” pictures of Ram Darbar do not include Angad and I allowed my mind to speculate on the matter. Obviously, a picture of Ram Darbar is linked to the concept of Ram Rajya and this golden era of the rule of Lord Rama is supposed to have lasted for a very long period of time. The Ramcharitmanas which gives a glorious description of Ram Rajya does not mention a specific time frame but the Ramayana of Valmiki as well as some other Ramayanas mention a duration of something like 12000 years. According to the Ramcharitmanas, Angad remained in Ayodhya with Lord Rama for only a few months after the coronation. After that he returned to Kishkinda together with Sugriva, Jambhavan, Nal, Neel and other leaders of their tribe. Only Hanumanji remained behind to become a permanent citizen of Ayodhya and an intergral member of Ram Darbar. Perhaps, this is the reason for Angad not being considered as an intrinsic member of Ram Darbar by the “North Indian” artists. With regard to the characterization of Angad in the Ramcharitmanas, I must admit that only a few characters in the entire epic evoke as much interest as Angad. Even though his role (in comparison to the other leading characters of the epic) is small, the lessons contained in it for a seeker on the spiritual path is crucial. Without going into any detailed discussion, it should suffice here to say that in the characterisation of Angad, Tulsidasji has mapped out a path of sadhana by following which a spiritual seeker can progress to attain devotion and salvation. Anyhow, this is what I believe but I would love to hear Maharaj’s thoughts on the subject. It was a pleasant surprise to receive your valuable comment despite your busy schedule in spreading the Ramacharitmanas among the devout Hindus here. Yes, I do agree with your opinion that due to the fact that Angad did not continue to stay on in Ayodhya, perhaps he was not included in the widespread Ram Darbar paintings. The painting artists have been taking different episodes from Ramayana reflecting what were narrated in the scriptures and most likely there was no reference of Angad in the Ram Darbar in Ramcharitmanas as well as in the many North Indian traditional stories. And we should not forget that Ram Darbar began with the ‘coronation ceremony’ of Ram being crowned as King, to the last day of Sri Rama’s rule. So logically, since Kamban has mentioned the presence of Angad, (may be before his ‘departure’ from Ayodhya?) the “South Indian” artist has drawn it suitably. There is nothing wrong in Not including Angad in the Ram Darbar paintings; I just added this painting as something not popularly seen anywhere in India. For your information the same Ram Darbar painting sans Angad is what most widely used picture for worship everywhere. I am of course deeply interested to know the ‘sadhana mapping’ of Tulsidasji through the narration about Angad. I hope you, being a renowned scholar will definitely throw some light on that aspect in your Institute Blog. I eagerly await for that. May Sri Hanumanji bless you in your endeavour! I am somewhat embarassed by the lavish praise heaped upon me in your reply to my post. Naturally, I am touched by your loving generosity and kindness. But I know that I am unworthy of such praise coming from a person of your spiritual stature. With regard to the ‘sadhana mapping’ of Tulsidasji through the narration about Angad, I must confess that this is an idea which I picked up from a discourse by revered Sri Ramkinkarji. I shall take your request as a religious instruction and write an article on the subject for our Institute blog as soon as possible. Your reply delighted me. I look forward in a few days’ time to your keen observations in your Institute Blog. Undoubtedly I will be able to nourish myself with the nuggets of truth that are in the nectarine scripture. Yes, I adore that wonderful Sri Ramkinkarji who is no more in his physical body. But I must confess that he still abides in me whenever I take the books that contain his numerous pravachan (discourses). What an interpretation of those mesmerisng words of Tulsidasji! His explanations are not only logical, but also bring out the hidden spiritual essence that many of the narrators lack. And a special thanks to you for getting two books of him when you returned from India recently! All his books contain mine of knowledge and I don’t know when they will become ‘mine’! How are you? Please accept my humble greetings and obeisances on this auspicious occasion of Akshaya Tritiya which is one of the most blessed days in the Hindu calendar, and please bless us all that we may have access to Annapurna‘s infinite store in this life itself. Revered Maharaj, I have been very busy with exams and therefore not so regular online but it has been such a while since you have updated this divine blog and although one understands the many calls upon your precious time, yet, I want to say that I miss it very much. Thanks for the good wishes on the auspicious Akshaya Tritiya occasion! Yes, my hearty greetings to every one of you including your pets. This is the first time that I have seen Angad added up in a Picture where Sri Ram with Mother Sita, his brothers and Hanuman are there. Is there any specific reason for adding Angad? For that matter why other characters like Jambavan, Sugriva and others could also have been added who were more active in this epic? The artist who drew this Ram Darbar painting presumably had taken inspiration to include Angad from the line quoted in my post above from Kamban’s Ramayana. We must note here that an artist draws inspiration from what he reads or experiences. In fact any number of characters can be added in the Ram Darbar provided any artist gets that type of inspiration. Of course as Sri Ram’s devotees, we have the liberty and can easily imagine graphically all those participants in Ramkaaj in the Darbar (assembly). But the picture of Darbar with essentially four or six characters is indeed conducive for puja and dhyana, definitely not a crowded picture. I remember to have seen a huge painting most probably in Madurai Meenakshi temple hall, I think, of a scene that depicts the wedding of Lord Shiva wherein a host of gods and goddesses, rishis and munis are there. As children we used to go into competition in identifying those devatas and rishis in short a who’s who game!! May Sri Ram bless you all! I do not know you but thru’ this blog site, I have come to know that you are spreading spirituality of India throughout the world. I have worked on Ramayan and brought out the meaning of the text versified in English in a book form. Please go thru’ this site and shower your blessings. I should mention here that I was blessed with initiation by Revered Swami Gambhiranandji, the then Vice-President of the Ramakrishna Mission in 1987. I am happy to know that you are an initiated devotee of Sri Thakur Ramakrishna. Its indeed wonderful that you have brought out the meaning of the text versified in English. Which text did you adopt – Tulsidas’ Sri Ramcharit Manas or Valmiki’s Ramayana? I understand that the book is yet to be published. We shall love to have a copy for our Library. Its a matter to mention that the Epic book on “Ramayan – The Hymns of Himalaya” with its first edition exhausted, is getting its reprint through Prabhat Prakashan, New Delhi. I wish to know what way may I send this book to you. Happy to learn that in such a short time the first edition of your book on Ramayan got exhausted! Welcome to the second edition! I am thankful to you for willing to send us a copy. Ok. I would request any of our devotees to pick up that packet from there. Again thanking you for your wonderful gesture! May Master’s grace be with you!